The Pirate Poetry Contest ended yesterday and I had a chance to review all of the entries again. I have to say, they were all amazing in their own way. Unfortunately, I could only pick one winner. And it was HARD! Seriously, this was possibly the hardest contest I have ever had to judge. So thank you to everyone who entered! Even if you didn't win, know that I thought your entry was great! Here is the winner: Cassandra Blake! 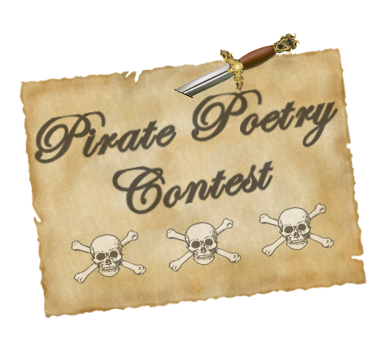 Here is her entry: My pirate's name is Cassandra Blake, and I wrote a Pirate themed haiku for the contest. It also includes yum, so I guess you could say Pirate101 is also included! Sea, the pirate's true lover. A pirate's heart longs for such! For these, they loot foes. Pirate's know how to fight and shoot. For brawls earn them loot. Only each other they trust. Ho! And a bottle of yum." Proud of their black, crossboned flags. With them they strike fear. A pirate's life, their choice be. Wow, really honored that I was chosen! I read the rest of the entries, all of them truly are fantastic! So really, thank you very much!